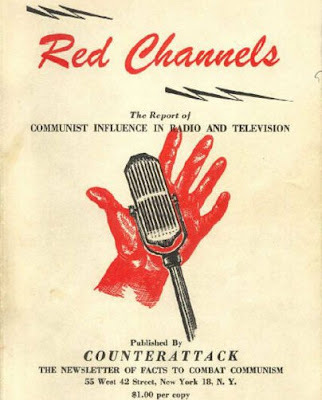 In June 1950 the notorious report Red Channels: Communist Influence on Radio and Television was published by American Business Consultants Inc., a company established by former FBI agents. The anti-communist tract, which is seen below, accused 151 prominent Americans working in the arts and media of having communist connections, and created a blacklist which profoundly affected the careers of those on it. The musicians named included Aaron Copland, Leonard Bernstein, Morton Gould, Marc Blitzstein and Pete Seeger. There was only one classical pianist among the famous names blacklisted, and that musician was a woman. 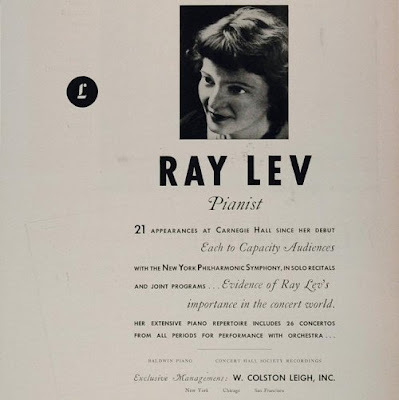 Ray Lev, who is seen above, was born in Rostov na Donau, Russia in 1912, and a year later moved to the United States with her father, a synagogue cantor, and her mother, a concert singer. After studying in London Ray Lev made her public debut there aged 17. She went on to became one of the leading American classical pianists in the 1930s and '40s and made a number of recordings. Ironically, these included Schubert's unfinished Piano Sonata in C Major, D. 840 in the now forgotten 1921 completion by Ernst Krenek, who had himself been blacklisted by the Nazis in 1933. In the Second World War Ray Lev performed for American troops and played in front of President Roosevelt. We want to share responsibility with you . . . Our enemies will see that our international solidarity for peace and democracy stands firm against their frantic writhing and thrashing. On this May Day we grip your hand . . .
One of the signatories was Ray Lev. Prior to this open letter the pianist's name had appeared in the transcript of the 1947 House Un-American Activitees Committee report into the Civil Rights Congress as a communist front (see Civil Rights Congress 25). The pedigree of American presidential candidates makes interesting reading; one of the members of that 1947 HUAC session was 'Richard M. Nixon - California'. Being blacklisted in 1950 meant a lot more than having extended ID checks in the frequent flyer lounge. The denouncing of Ray Lev as a communist sympathiser effectively ended her career, and she died in 1968 an almost forgotten figure. But we are fortunate that Naxos has made some of the pianists recordings available. These include her Bach transcriptions and she also features on Naxos' enterprising Women at the Piano series. Now read about the American who became the Berlin Philharmonic's first woman conductor. Thanks for remembering Ray Lev. I never knew her but she was one of a number of New York-based left wing artists my folks knew through political activism. I've been told she committed suicide, partway through a project of recording the complete piano music of Robert Schumann. What a cruel, pointless destruction of a human being and a career; truly that was Scoundrel Time, in Lillian Hellman's phrase. Stop slagging on John Adams for his "blacklisting" remark. In truth, he was blacklisted from opera houses worldwide after "The Death of Klinghoffer" for depicting Arab terrorists as human beings. The subject was more because of the Peter Sellars/Alice Goodman impresario/librettist relationship than Adams' own sympathies, but I have nothing but respect for him for not backing down from the integrity of his own work. As for the rabblerousers who are being held up as the paragon of martyrdom, it sometimes feels like nothing more than Old Testament schisms, with all the passions that old yin/yang passions between capitalism and communism / fascism and anarchism have entailed over the last 150 years. It's time to frigging move on. On An Overgrown Path will continue to remember 'the rabblerousers who are being held up as the paragon of martyrdom' as well as highlighting both the new and the absurd. Similarly, I am sure others will 'frigging move on' in their own unique way. Dear Pliable: Sorry for the intemperance of the above remarks. I get sick of the same old ideologies and counterideologies being recycled endlessly but that's certainly no excuse for rude language. And "rabblerouser" was being used with affection and irony but it doesn't come across that way. Apologies. Michael, no problem at all. You know by now, I am sure, that very little phases me - except dishonesty. And I know, in turn, that although your comments may sometimes be impassioned, they are always honest.